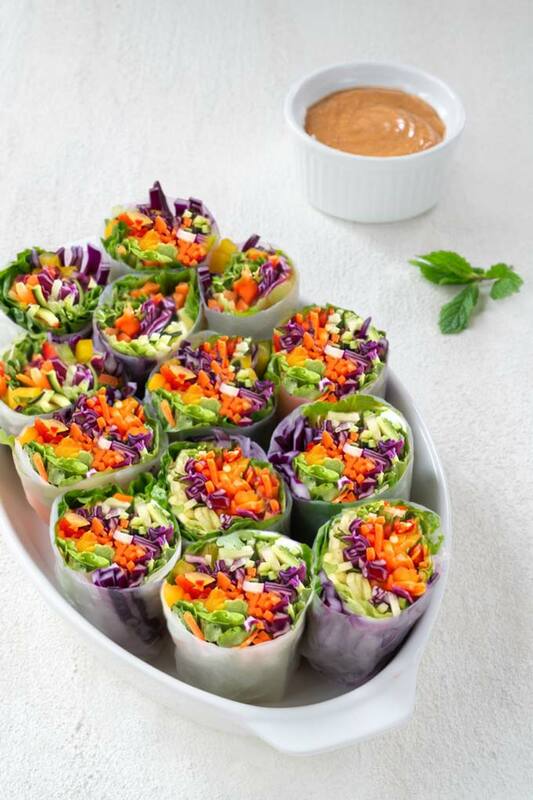 Fresh spring rolls are such a versatile food. They are essentially a blank canvas you can fill with whatever you’re in the mood for. Noodles, tofu, vegetables, fresh herbs – they’re all equally delicious. 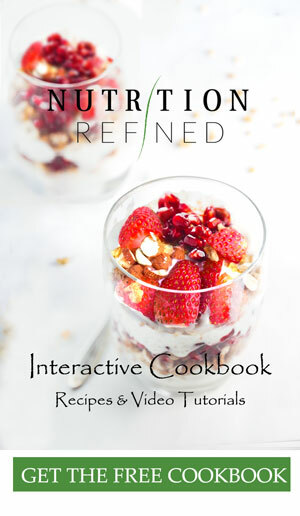 If you’ve followed my blog for a while you probably know that I have a thing for raw food. 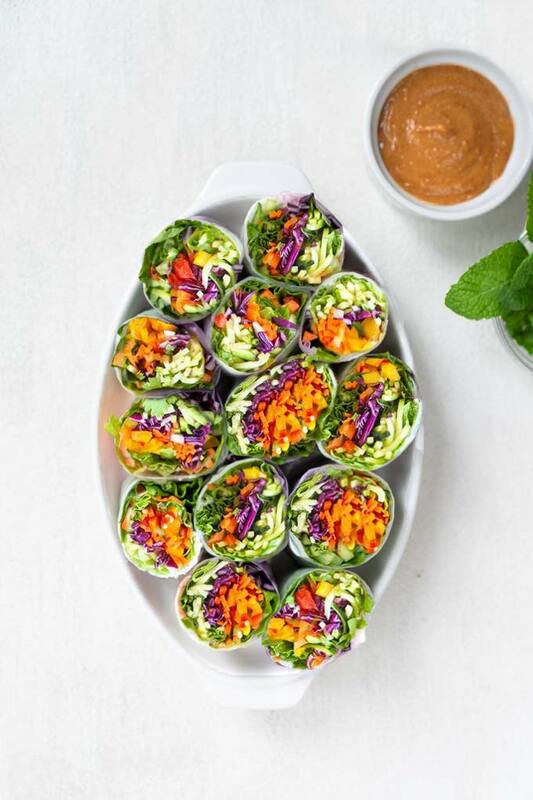 While these salad rolls aren’t entirely raw, they truly are my kind of food – fresh, filling, and packed with flavor. Three years ago, I ordered fresh veggie spring rolls (also called summer rolls) at a Granville Island Farmer’s Market in British Columbia and my life was forever changed. OK, that’s a bit of an exaggeration, but really – they rocked my world. How can something as simple as fresh spring rolls taste so good? It’s just some raw veggies and mung bean vermicelli noodles wrapped in rice paper. Of course, there’s also the delicious dipping sauce, which really is the showstopper of this recipe. It’s good! I mean, really good. When I lived in Vancouver, I would order these veggie spring rolls at least twice a week for lunch from the most amazing food stand in Granville Island. Note to you, if you are ever in Vancouver, going to Granville Island market is a must. Not just for the spring roll stand but the market in general. You could spend a whole day there … easily. As the locals themselves would point out, the market is a jewel in the Island’s crown. Since rice paper is what holds spring rolls together, it’s essential that you chose the right one. Rice paper comes in various shapes and sizes and so do spring rolls. The most widely available rice paper comes in an 8 1/2″ (21.5 cm) circle. It’s the easiest to manipulate, and most recipes use that size. Smaller circles and triangles are more difficult to work with; larger circles are meant for long rolls that are usually cut up into smaller pieces. Though rice paper thickness varies as well, the difference isn’t very significant. As far as the ingredients go, rice paper should only contain rice, water, and salt. That’s it. Avoid super thin all-tapioca starch paper. It lacks flavor, tears easily and becomes limp quickly. 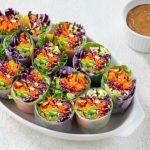 I like to fill my spring rolls with a lot of vegetables – including lettuce, bell peppers, carrots, and avocados – various herbs, and bean vermicelli. You’ll need to work quickly so have all the ingredients for spring rolls ready. This includes washed and julienned vegetables, chopped lettuce and herbs, and cooked vermicelli. If you prefer less filling spring rolls, you can use more vegetables instead of the noodles. The noodles are essentially just a filler to add body to the spring rolls. So as long as you use something else in their place, you’ll be fine. Rice paper is delicate and only needs a quick dip in water to soften and become pliable. Do not soak the rice paper for too long because it will stick and tear, making the rolling impossible. I usually fill a wide shallow bowl with warm water and dip the rice paper for about 3-5 seconds (the thicker the rice paper, the warmer the water needs to be). The rice paper should come out still slightly firm because it will continue to absorb water as you lay the filling ingredients on top of it. After dipping, put the rice paper on a damp towel or a wet cutting board (if you put the softened rice paper on a dry surface, it will stick). If you’re using circle rice paper, start laying ingredients at top 1/3 to have enough room for rolling. The more rotations of rice paper you have, the thicker and stronger the roll becomes. I would recommend laying the noodles or lettuce on the rice paper first to avoid any sharp veggies to tear the soft rice paper. Then add all the other ingredients. Just be careful not to over-stuff the roll or it might burst. When you’re ready to roll, bring the top edge up and over the filling, then fold in the two side flaps, and then roll the entire thing up. Keep tucking all the ingredients together as you roll. You want to end up with a tight and straight spring roll. To store the rolls, wrap each finished roll in plastic cling wrap to prevent the roll from drying out. Make sure you wrap each roll individually, so they don’t stick together. If they stick, the rice paper will tear when you try to separate them. You can also wrap the rolls in a moistened paper towel, but just keep in mind that as soon as your paper towel dries out, it will stick to the rolls. These spring rolls are filled with crunchy veggies, fresh herbs, and vermicelli noodles. Serve with a peanut lime sauce for a satisfying meal. Put all the ingredients except for the water into a high speed blender and blend until smooth. If you're not using fresh garlic (or are able to mince it finely). you can just whisk all the ingredients in a bowl. Add water as necessary (the sauce should be pourable). Cook the vermicelli noodles first. Since the noodles are very thin, they don't need to boil. Just pour hot water over them and let them "cook" for about 5 minutes (read the instructions on package), Once soft, drain the noodles and set them aside. Then prep all the veggies and herbs. To assemble the spring rolls, pour warm water into a shallow dish and immerse the rice paper to soften, for about 5 seconds. The rice paper should be pliable, but not too soft. If it becomes too soft, it will stick and tear. Always work with one rice paper at a time. Transfer the rice paper onto a damp kitchen towel. Add a handful of the vermicelli noodles, 1/2 lettuce leaf, carrots, cucumbers, bell peppers, avocado, green onions, basil, and mint to the To the top third of the rice paper. Do not over-stuff the roll or it might burst. Gently bring the top edge up and over the filling, then fold in the two side flaps, and continue rolling until seem is sealed. 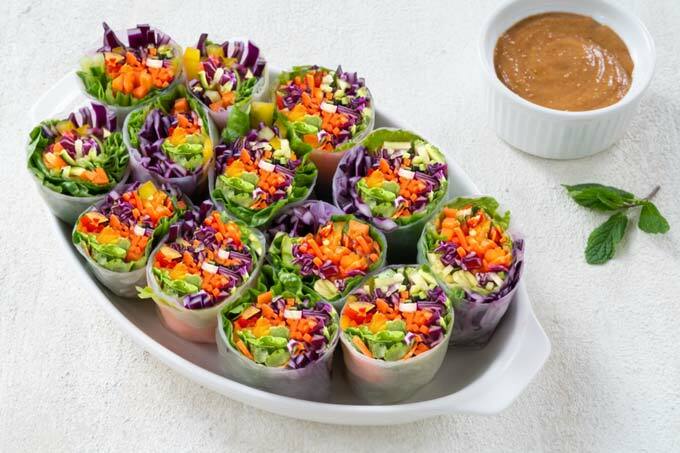 Wrap each roll in a damp towel or cling wrap to prevent the spring rolls from sticking and drying out. Repeat until all the filling ingredients are used up. Serve with peanut sauce. Store leftover spring rolls covered in the refrigerator for a few days, though best within the first 24-48 hours. Thank you for sharing your recipes. You are wonderfully skilled. Love the way you are displaying the food. It is pure art! Thank you so much for the kind comment, Dorina! I apologize for the inconvenience with the print button. I am switching to a new recipe plugin as I type. I thought it would be an easy switch, but unfortunately, I have to retype all the recipes. I am starting with the newest recipes so the print button should be working on some of the newer ones. Hopefully I can get all the recipes switched within the next two weeks. Thank you for your patience! Love all your recipes! Thank you so much for sharing with us!